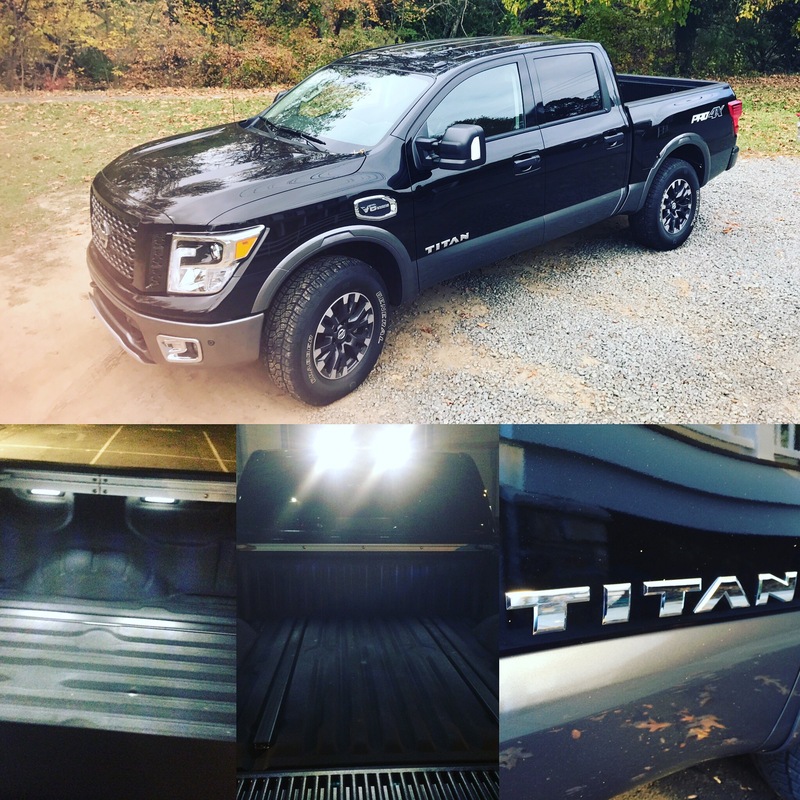 I had heard a lot about the all-new 2017 Nissan TITAN truck and was pretty excited when it was my turn with it for a week. I had spent about ten minutes in the TITAN Crew Cab for a short drive at a recent Nissan event and I had been hoping to get more time in one ever since. So when the 2017 Nissan TITAN Pro-4X 4WD CC showed up in the driveway, I was ready to go. The first generation of the Nissan TITAN began with the 2004 model year and was based on the body-on-frame Nissan F-Alpha platform shared with the first generation Nissan Armadas. The TITAN was available with rear-wheel drive or shift-on-the-fly four-wheel drive. It came standard with a 32-valve V8 engine generating 305 hp (later increased to 317 in 2007) and 385 lb-ft of torque matted to a five speed automatic transmission. Only an extended King Cab with a 6 foot 7 inch bed or crew cab with full-sized back seat and 5 foot 7 inch bed was offered at this time with the beds growing to 8 foot 3 inch and 7 foot 3 inch in 2008 when a longer wheelbase was introduced. Nissan launched the TITAN XD in 2016 as a “powerful precision tool” for hard working, hard playing buyers. The TITAN XD received the powerful new 390-hp 5.6-liter Endurance V8 gasoline engine putting out 394 lb-ft of torque and offered a Cummins 5.0L V8 Turbo Diesel with 310hp and 555 lb-ft of torque as an available option. The TITAN Crew Cab is all-new for 2017. Nissan put the same 390-hp 5.6-liter Endurance V8 gasoline engine from the TITAN XD and the Armada in the new TITAN and it comes in a 4×4 and 4×2 option. The new redesigned TITAN exterior is focused on improved aerodynamics with about a ten percent improvement over the prior model. New front, roof and tailgate spoilers, front tow hook cover, rear tire wind deflectors, a seal between the cab and bed and an Active Grill Shutter make up the bulk of the new aerodynamics package. The all-new TITAN gets LED headlights, daytime running lights and taillights as well. The interior is all new as well with a 33% increase in front storage and 28 percent in rear storage with the 2nd row underseat storage including a locking lid. The front center console can hold a tablet or 15-laptop. NissanConnect with Nav, 7-inch color touch-screen display, Siri Eyes Free, Nissan voice recognition for nav and audio, Blind Spot Warning, Rear Cross Traffic Alert and RearView Monitor round out the interior technology features. With the new increase in horsepower and torque as well as new towing features, the new TITAN is well equipped for towing. Integrated Trailer Brake Controller, Trailer Sway Control, Tow/Haul Mode with Downhill Speed Control, Trailer Light Check system, Trailer Guides added to the RearView Monitor and Around View Monitor, and Moving Object Detection round out the technology and towing options that make the TITAN so well suited for towing. Add to that a 9,390 pound towing capacity and a maximum payload capacity of 1, 610 pounds and you have a truck ready to handle any job you can throw at it. The Pro-4X 4WD CC adds the Pro-4X Utility and Tow Package for an additional $1,820, the Pro-4X Convenience Package for an additional $3,530 and the Pro-4X Luxury Package for an addition $750 bringing the fairly reasonable TITAN base price of $45,020 to a fairly substantial $52,305 (which includes a $1,195 destination charge), a decent amount for a truck, but this isn’t just your average work truck. The Pro-4X Utility and Tow Package adds some goodies you are going to want if you plan on doing any towing: trailer brake controller; trailer light function check; and extendable, folding, power, heated tow mirrors with puddles lamps. There are also a bunch of goodies in this package that you might want regardless of the amount of anticipated towing: front and rear sonar; Utili-Track System with four tie down cleats; tailgate area illumination; LED under rail bed lighting; 120v in bed outlet; and power slide rear window with defrost. The bed lighting alone might not warrant the additional $1,820, but its really really cool and may make you think about it a little. And that 120V in bed outlet will come in handy if you’re going to do any work with this truck. The Pro-4X Convenience Package gives you all the stuff you’re used to having in today’s overpriced SUV’s and that you may not expect or need in a truck – but I sure like them: leather appointed seats with contrasting stitching and Pro-4X embroidery; 4-way power passenger seat; heated front and rear seats; power, heated, tilt and telescoping steering wheel; memory for steering wheel, driver seat, and outside mirrors; remote start, auto-dimming outside and rearview mirrors; and NissanConnect. The Pro-4X Luxury package adds ventilated front seats and AroundView Monitor with moving object detection and reverse auto tilt on the side mirrors. The TITAN Pro-X 4WD CC is an incredibly well appointed truck. Its big, but doesn’t drive big. It turns heads. People stop you to talk about it. People like it. People want to sit in it. It is probably way more truck then any one reasonable person needs for the jobsite, but then again we live in America where what we need and what we want are usually not necessarily related. I don’t need all of these luxury items in my truck – but I sure want them. Previous Entry 2017 Volkswagen Golf Alltrack: Subaru Who?